New Year’s Eve is tomorrow! Now, you probably have already made plans. In which case, congrats and party on! (Tomorrow. Today rest a little, alright?). However, if you haven’t made plans and are the adventurous “let’s get on a plane and go to…” type. Or, if you do have a general idea of wanting to take your loved one(s) or your best buddy(ies) somewhere for a change of scenery, but you just don’t know where exactly, well we’ve got you covered. Take a look at the 5 popular New Year’s Eve party locations below. If you find one that really clicks with you, just book some tickets and go have your adventure. If you already happen to be going to one of these locations, good for you! You’ll not be missing company! That’s for sure. This destination is so iconic that it had to start of our list as well. I mean, come on, it’s the most famous destination in the country that is the only current superpower and is responsible for massively influencing world culture in the past decades! 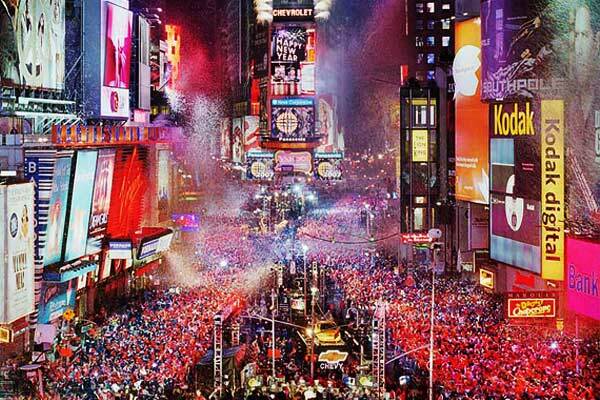 So, if so many of USA’s citizens go to New York to celebrate New Year’s Eve, there must be something to it! But it’s not just any old place in New York, we’re talking about the massive million people gathering in Times Square where the just as massive (and legendary) New Years’s Eve ball makes its 60 second drop at midnight, counting the seconds to the New Year. The ball has dropped since 1907 to present with the exception of 1942 and 1943 because of World War II. What New York is to Americans, London is to the British, and British-culture lovers alike. And in an appropriate parallel, they gather in Trafalgar Square. By the hundreds of thousands each year. The big attraction of course is Big Ben which raises is bell voice at midnight to announce the arrival of the new year as it has for more than 150 years since its completion in 1858. There’s fireworks and all around merriment, probably induced by the strategically placed excellent pubs close by. Naturally, we wouldn’t mention London without instantly thinking of its continental counter-part, Paris. 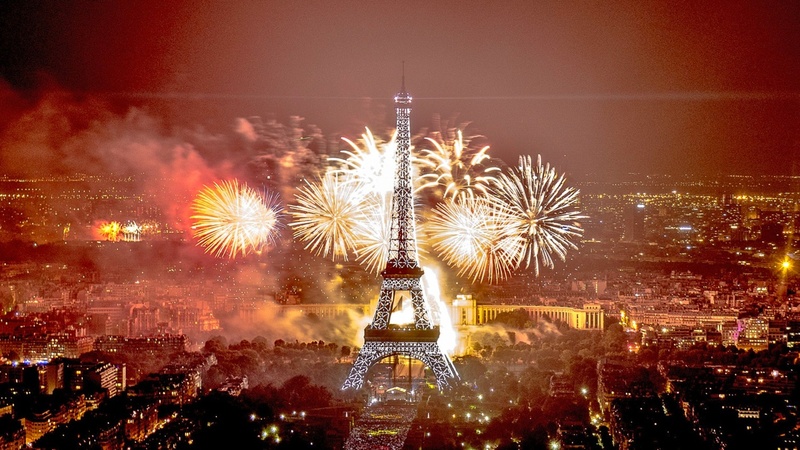 Apart from being considered one of the most romantic destinations in the world, which only gets amplified on New Year’s Eve, on this particular night it seems like “The City of Lights” as it is named, manages to out-do itself. The Eiffel tower is the glorious star of the evening, draped in dazzling complex lights, but there are light shows and fireworks all over. As for partying, there’ no short supply. The biggest and most accessible being the street party on Champs-Élysées. However, this doesn’t mean that all the exquisite restaurants, classy locales or modern clubs that Paris is famous for close up or something. They’re there for your enjoyment. If you’re not Japanese and want to do something exotic (and if you can get there in time, depending on your flight time), why not spend your New Year’s Eve in one of the most interesting cultures in the world: Japan. As an important mention: it’s one of the only 2 times a year when the public can visit the Imperial Palace. New Year’s Eve in the capital will allow you to experience the familiar phenomenon of thousands of people celebrating together along with local customs like Japanes temples all ringing their bells, the ubiquitous buckwheat noodles that people eat so that they are happy and healthy in the New Year as well as the notable absence of fireworks which are still not common for New Year’s celebration in Japan. If you were disappointed about that lack of fireworks mention in the previous item on our list, don’t be sad, there’s a perfect alternative to fix it: go to Hong Kong! Still exotic (if you’re not Chinese…), still in Asia but renowned for its fireworks. China is in fact the country that invented fireworks around the 7th century BC. As you can imagine, they’ve had tons of time to practice and improve since then. And are considered by some to host the most complex and impressive fireworks displays in the world. A case in point? There have been pyrotechnics displays featuring dragons flying on the sky. Only problem is: the Chinese don’t celebrate New Years Eve by the Gregorian Calendar as most of the world. They have their own moon-based calendar which means their New Year falls in during our Autumn. Still, we couldn’t make a list of popular New Year’s Eve destinations without including the Hong Kong and the Chinese. Yeah, you can’t celebrate your New Year’s Eve there, but you can keep it in mind and plan for celebrating their New Year’s Eve next year. Then have the pleasure of celebrating the Gregorian one too. Two in one for the win!